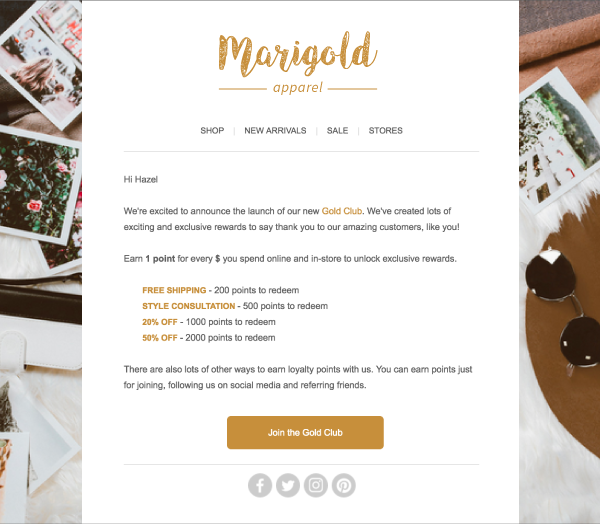 Here's a loyalty program launch email template that you can use to help explain your loyalty program to your customers. Using your mailing app, like MailChimp, Klaviyo or Campaign Monitor, create a new email campaign to your customer database. Then simply, customize with your own loyalty program details and add your creative stamp on your email. We're excited to announce the launch of our new [Name of loyalty program]. We've created lots of exciting and exclusive rewards to say thank you to our amazing customers, like you! Earn 1 point for every $ you spend [online and/or in-store] to unlock exclusive rewards. There are also lots of other ways to earn loyalty points with us. You can earn points for [completing your profile and referring friends]. Quick tip: Add your store's creative stamp to the template to make sure all your marketing is on point.